The decision in March of 2009 was--and the decision on Tuesday is--to continue a sales tax of one cent on the dollar for each purchase in the county. The 2009 SPLOST tax was to fund such county projects as utility department and road department improvements as well as farmland protection. The tax vote on Tuesday will be for capital projects at Oconee County schools. It also includes authorization for the sale of bonds to get started on those projects even before the tax goes into effect. The last time a tax issue was on the ballot in November in Oconee County was in 2003, when, as is the case on Tuesday, the ballot did not contain any other county-wide issues or decisions on any candidates. That year, 10.2 percent of the registered votes turned out. The last time the county faced a tax issue for the schools was in July of 2006, when voters also were deciding on statewide candidates, including for governor. In July of 2006, 24.1 percent of the eligible voters in Oconee County cast ballots. Voters in the city of Bogart will be selecting two candidates from among three running for two open seats on the city council. Watkinsville city voters will be selecting a new mayor, with two candidates seeking the job. Early voting for the education tax ended at 5 p.m. on Friday, and the count of 352 was the tally a half hour before closing. The next opportunity voters will have to vote is on Tuesday, when polls open at 7 a.m. and remain open until 7 p.m.
Bogart City Clerk Diane Craft said five citizens had asked for and been given an absentee ballot to vote in the city contest by the closing of the office at 4 p.m. on Friday. Kristen Willford in the city clerk’s office in Watkinsville told me at 4:30 on Friday that 139 persons had cast a ballot in early voting there. Oconee County had 22,788 registered voters on Nov. 1 of this year, according to figures given me on Friday by Carole Amos, administrative assistant in the Oconee County Board of Elections and Registration. Of those, 20,734 are active, and the remaining 2,054 are classified as inactive. Inactive voters are those who have not voted or otherwise confirmed their registration for three years. They are still eligible to vote, but the Georgia Secretary of State's office sends a confirmation notice during the fourth year. Those that do not respond are removed from the rolls. The Secretary of State’s office lists 569 active voters as of Nov. 1 in Bogart and 1,678 in Watkinsville. It does not list inactive voters. Going back to 1982, Oconee County voters have overwhelmingly approved special sales tax initiatives put before them. No organized opposition has surfaced to the education tax this year, but there also is little obvious advocacy for it. School officials are prohibited from promoting the tax, though they can provide educational materials. Board of Education Chairman David Weeks told me in an interview I did with him that without the tax the school system will not be able to go forward with the proposed projects, which include upgrades to technology across all schools, construction of athletic facilities for North Oconee High School, and renovation of Colham Ferry Elementary School and Oconee County High School. The ballot does not actually list the projects to be funded. Weeks said this is to give the board flexibility. The ballot language allows the system to borrow $13.5 million even before the tax goes into effect in 2013 so it can start the projects. The tax, if approved, would run for five years. Bogart and Watkinsville run their own elections, so voters there will vote separately on the city races. Bogart’s four council members do not have posts, and incumbents Ralph Sheridan and T.L. Turman have qualified for reelection. The other two members are not up for reelection, and no one filed to run against Mayor Terri Glenn. Her name will not be on the ballot, Craft told me. Turman’s wife, Linda, also has qualified, meaning at least one Turman is going to be on the council after the election is completed. Term of office is four years, and elections are nonpartisan. 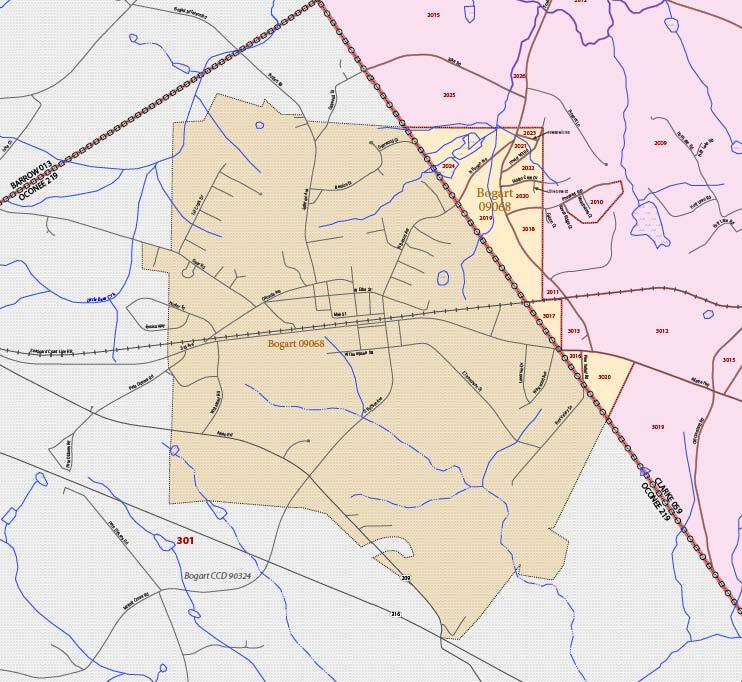 Parts of Bogart are in Clarke County, where an Education Special Purpose Local Option Sales Tax also is the only county-wide issue on the ballot. 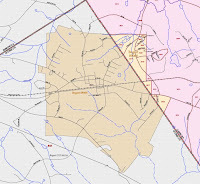 The Secretary of State records do not break out voter registration for Bogart based on county, but 2010 U.S. Census Bureau tract data indicate that of the city’s 1,034 residents, only 140 live in Clarke County. The Bogart post office delivers mail to 10,344 residents in Oconee, Barrow, Clarke and Jackson counties, according to the web site of Zip-Codes.com. The Athens Banner-Herald often refers to stories from much of Oconee County as originating in Bogart because they occur in a place with a Bogart Zip Code of 30622. All qualified voters in the city of Bogart, regardless of the county in which they reside, will vote for the city election at the Bogart Community Center, 141 E. Thompson St. The 1,687 active, registered voters in Watkinsville will be choosing between Charles Ivie and Dan Matthews for a two-year term as mayor. In the candidate forum on Oct. 13, the candidates agreed on more issues than they disagreed on, but they were very different in style. The names of incumbents Brian Brodrick and Henry Norman, running unopposed for posts 1 and 2 respectively on the city council, also will be on the ballot. Council members also serve two-year terms. The races is Watkinsville are nonpartisan. Watkinsville voters will be able to vote for both the city race and the Education SPLOST at their normal polling places, either at the Oconee County Government Annex on Greensboro Highway south of downtown Watkinsville or at City Hall on 191 V.F.W. Drive.